Welcome to my blog! Here you can find the latest on what's happening with me - performances, travel, studio work and 'mini lessons'. You'll also be able to find student video entries. Check back often! Dylan’s performance of “Me and My Broken Heart” by Rixton. This song has some nice grooves and fills- and Dylan nailed them. Congratulations to Dylan on a killer job with this song. 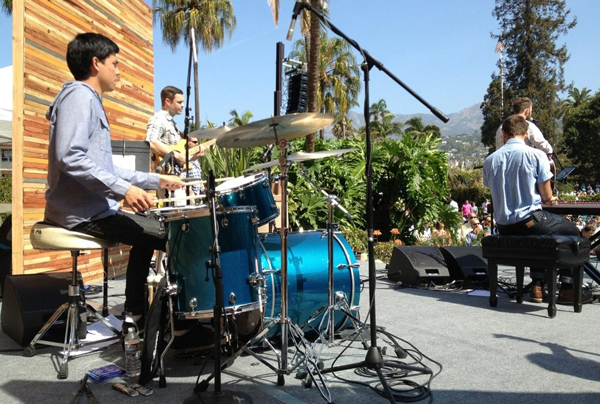 Dylan got his start on the drums during his first lessons almost a year ago. He has made a lot of progress and is doing great. I have a lot of fun teaching cajon. It’s an incredibly versatile instrument and there’s a lot you can do with it once you get the hang of it. This is a shot from a lesson with Brittany ‘The Cajonateer’. Yep, this is a late post. 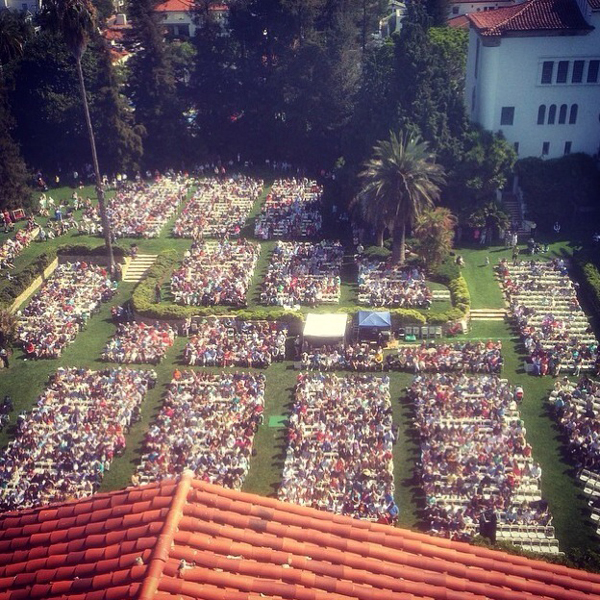 Had a blast playing with Joseph Pfeifer and the crew at the historic Santa Barbara Courthouse for Easter. At first I was thinking, “A courthouse?” But man- this place is a tourist destination for a reason. Beautiful place. Such a fun place to play, especially with these dudes! Had a great trip this past week to Vegas with The Scott Cunningham Band. It was a brief one but a lot of fun nonetheless! And you gotta do the mandatory (delirious) drive down the strip, you know?! Had the privilege of co-hosting The Christian Musician Podcast, ‘How To Play Drums’ recently. Part 2 (of 2) was released and you can listen to it below. -To read or not to read music? Hope that this helps you! If you didn’t get a chance to listen to part one, you can find it below. Last month month I met up with fellow San Diegan Scott Vanderwarf at my place to discuss God, life, music, and drums. Scott is the host and creator of The Christian Musician podcast, which covers different topics revolving around, well, the life of the Christian and musician. The podcast is very practical and is full of useful insights. 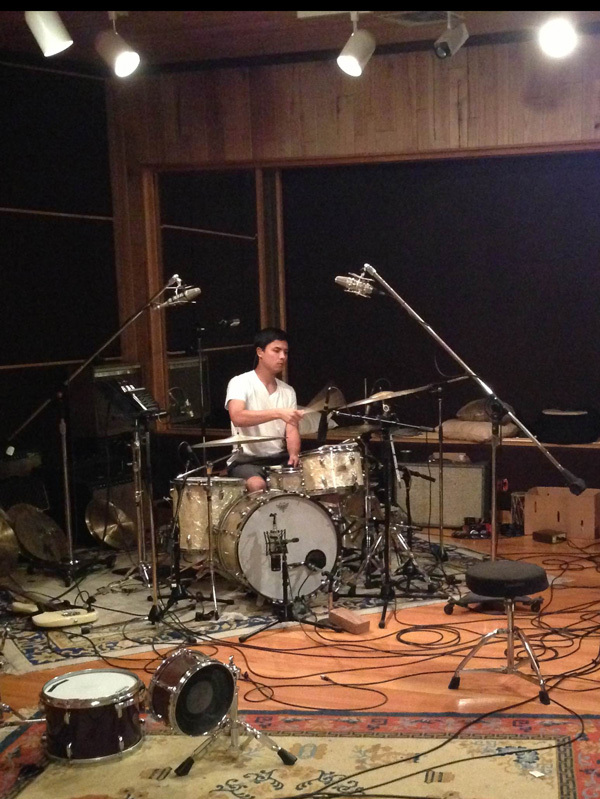 This months podcast, split into two episodes, is covering drums (of course). It was hard to know what information would be most beneficial for drummers to hear about considering that there could be anyone listening to the podcast – beginners or pros. So I tried to go over material that would hopefully benefit anyone and everyone. In this first episode, more of the info is geared toward beginners. More advanced material will be covered in the next episode (in two weeks). 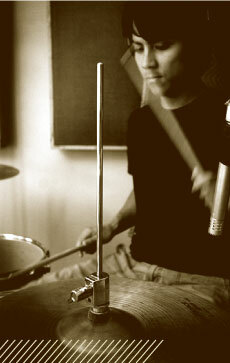 -My beginnings about walking as a Christian and as a drummer. -My experience working for different artists such as Leeland, Bethany Dillon, Future of Forestry, Evan Wickham, the Eagle and Child, and more. -Advice on what you need to get started and how to grow from where you are. -4 things I recommend to people just starting out. -Suggestions for beginning on a church music worship team. You can hear the audio below. 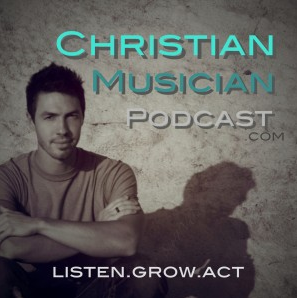 If you enjoy this podcast and would like to hear more, be sure to visit Scott at The Christian Musician Podcast (.com). Links to subscribe are on the page. Christian’s video performance of “Change” by Trevor Davis. I love the groove on this song. So fun, and Christian performed it really well. Funky stuff! 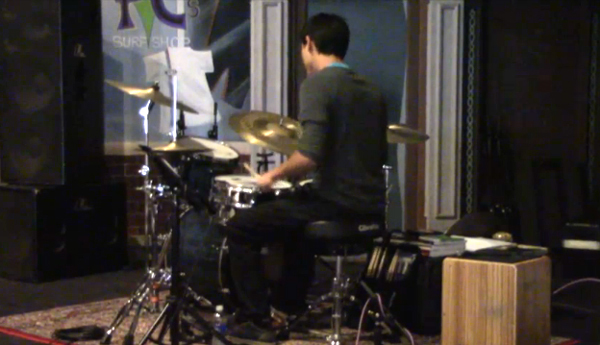 Christian is 14 and has been playing and taking drum lessons now for about two years. He’s a very talented drummer and is getting to perform regularly with the worship team at his church. Good job Christian!! To hear more of Trevor Davis’ music (previously featured on ‘The Voice’), click HERE. It had been a while since I got to hang with my good friend and former bandmate Eric. Since we went in different career directions years back, we only get to see each other on occasion- but it’s always a sweet time. For anyone who has been in a band knows that it is like a family, and there are really close bonds that can be made. So it was great to be together and catch up. 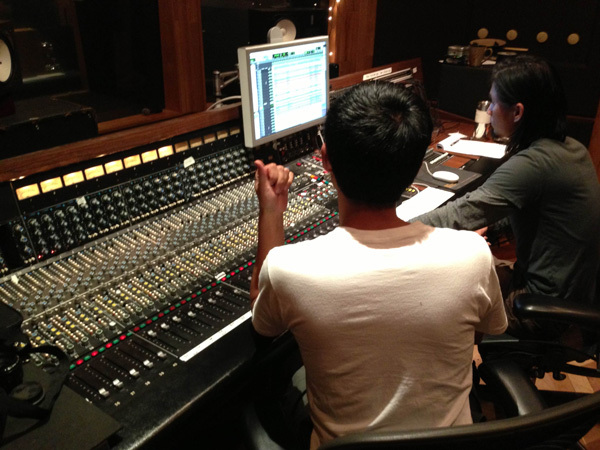 Eric recently asked me to be a part of a project that he’s doing and wanted to spend a few days recording at Big Fish studios up in the Encinitas area. Tons of records have been made here (Switchfoot, POD, Blink 182, Jimmy Eat World), and we had a great time hanging and recording music together. I don’t have any details about the project right now, but here are some photos from our time. This past week I had an awesome opportunity to teach a workshop at the annual Calvary Chapel Worship Leader’s Conference in Murrieta, CA. 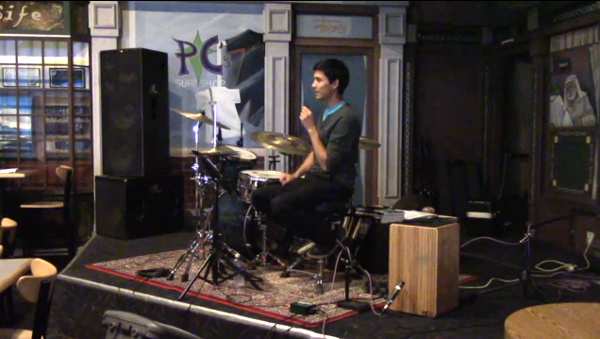 The workshop was geared toward drummers and/or percussionists of worship teams. It was a really fun time teaching and I enjoyed some of the questions and feedback. I also had the pleasure of performing with Char Broderson, and Madison Cunningham at different times throughout the conference. 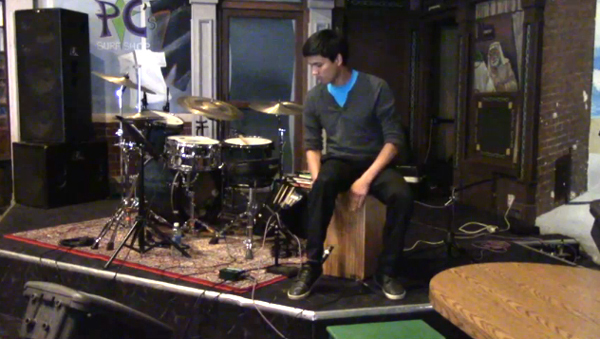 During the workshop, I spent some time addressing the world of both the cajon player and drummer. My goal was to gear either person up for success as a well rounded musician and have a solid understanding of their role in a band. So much material to cover in 75 minutes! It was a fun challenge to try to make it beneficial to both beginners and advanced players who were in attendance. To see a video of the workshop, you can stream it HERE.